In this review we have a look at the RW Banking platform that is ready to take money away from you. According to its presentation RW Banking is supposed to be a global platform for investments in encryption and digital assets. It allegedly is one of the biggest digital banks in the world. 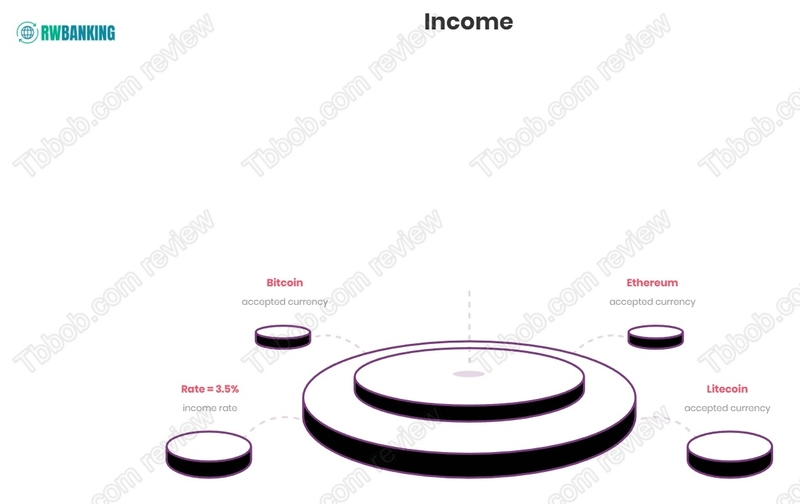 Currently it has an interest rate on deposits of 3.5% per day, which is 105% per month. Can you really double your money every month with RWBanking? First of all, RW Banking is not a bank, by far. In fact, there is no real company behind this project, let alone a financial institution. RW Banking is not regulated, it has no licence to provide investment or any other financial services. Therefore, it cannot offer its services legally in most countries. 105% per month is extremely high. In trading cryptocurrencies you might get lucky and get that kind of return in one month, but you certainly won’t be getting this every month. The thing is, when you know how to trade cryptos profitably, you don’t give away your profits to others. In fact, trading bigger volumes reduces your profits, so it makes no sense to trade for others. All in all, RW Banking is a scam. It is designed as a Ponzi scheme, which means that it might pay out a few profits at the beginning, but as soon as withdrawals exceed deposits, it will collapse. That’s its inevitable destiny. RW Banking is a scam, it has nothing to do with a bank, it is an illegal financial game. Stay away from it! If you want to try to make money in crypto trading, start on a free demo with a regulated broker. You have things to learn and understand before you can switch to trading with real money.